You can clean dirty, unscratched golf balls quickly and easily at home while saving money on the cost of a new one. 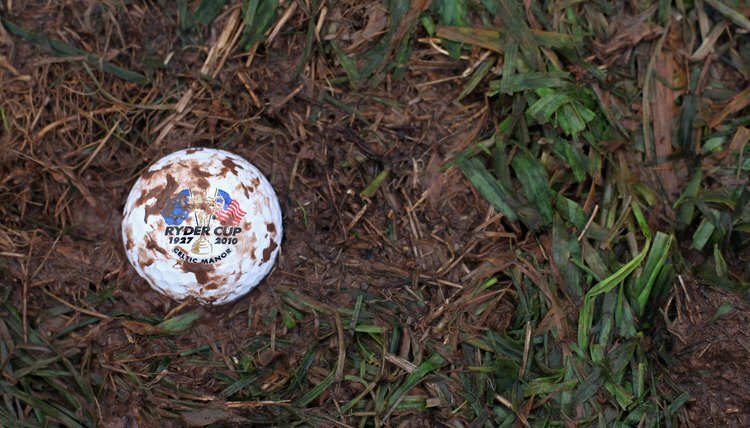 Dirt and debris can affect the flight and distance of a well-hit golf ball. The dimples on a golf ball help convert the spin generated by a drive into lift. But mud and other debris in the dimples can degrade ball performance. Purchasing new golf balls is an option, but that can prove expensive and unnecessary. The next time your golf balls are dirty, and covered with even the nastiest debris, follow a few simple steps to get them shiny and ready for the next round of play. Place a bucket or other container that can hold a gallon of water on an a flat area where water will not cause damage. Place an old rag or towel under the container to catch any splashed or dripped water. Add three-fourths of a gallon to one gallon of hot water to the bucket or container. Use caution when you pour the hot water, so that it does not splash. Add three effervescent denture cleaning tablets to the water. Use a long handle spoon or other object to space the tablets around the bottom of the container to optimize the cleaning bubbles in the water. Add the dirty golf balls to the bucket of hot water and denture cleaning tablets. Do not wait too long between adding the tablets and the golf balls. Allow the dirty golf balls to soak in the cleaning bubbles for several minutes. Remove the golf balls one at a time, and examine them for remaining deposits of dirt or debris. Use an old toothbrush to finish removing any stubborn deposits. Rinse the golf balls in cool running water to remove denture cleaner and loosened debris. Dry the golf balls with a clean rag. Place the balls in a location where they can continue to air dry before you place them back in your golf bag. The K-9 Aeronautics Internet Textbook: Why Does a Golf Ball Have Dimples?